I feel like I'm in a bit of a new mom/summer time blogging rut. I'm ok with it because most of my days are filled with Ella (which is so much more fun these days since she's smiling, super alert, and learning new things every day), and I know these days are numbered before the dreaded first day of school comes (insert DUN DUN DUNNNNN sound here). 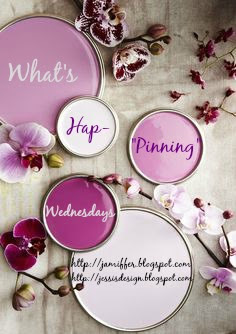 I'll try and get my act together and post tomorrow, but for now, link up with Jessi and I and share what's hap-"pinning" with you! You are doing important work! Taking a break is expected! Girl, enjoy that baby!! We'll all be here when you come back! Summer blog rut is totally I thing - I blame the heat! ;) Enjoy that baby girl!!! girl, the struggle is real to do it all. Enjoy ella, she is only small once.